In addition to JR (Japan Railway) lines, there are several other railways operating in the Tokyo area, including the underground lines of Tokyo Metro and Toe Subway. Find out what are the convenient discount passes that each of them issues. The Japanese railway system is world-famous for being well organized and efficient, but the very complex network of lines which are specific to the metropolitan areas may be daunting at first sight. In many countries from Europe and America, railways play an essential role in connecting cities and towns, while public transportation within urban areas is ensured by buses, trams and underground railways. In Japan, you'll be using trains to move around both within and between urban areas. Nevertheless, the underground railway network of the larger cities is also very well developed, and you might need to switch between surface and underground lines in order to travel efficiently. If you want to use convenient discount tickets and passes such as the Japan Rail Pass or the Tokyo Metro 24-Hour Ticket, you will need to distinguish between the various railway companies that run either surface trains or underground trains, and remember on which railway is your ticket valid. The aim of this article is to explain Tokyo's railway system, introducing the railway companies that operate surface and underground trains in the metropolitan area, along with the convenient discount tickets and passes offered by each of them. Japan Railways (JR) has the most extensive network of train lines running both within and between Japan's cities. JR is also the company running the shinkansen (bullet train) lines. If you have a JR Rail Pass, you can use it to travel very cost-efficiently on all the JR lines, including the Shinkansen lines, in any area of the country. Let's see what are the main lines run by JR within the Tokyo metropolitan area. There is a total of 36 lines run by JR East (*1) in the Tokyo area, connecting the various areas of the city, the suburban areas, and the cities in the neighboring prefectures. We will introduce here the main lines and the ones that may be of particular interest to visitors from abroad. *1 JR East is the JR branch that covers the Kanto region (Tokyo, Kanagawa, Saitama, Chiba, Gunma, Ibaraki, Tochigi, and Yamanashi), the Tohoku region (Fukushima, Yamagata, Miyagi, Akita, Iwate, Aomori) and the so-called Shin'etsu region (encompassing Niigata and Nagano). The Yamanote Line is a loop around the center of the city, connecting Tokyo Station with areas such as Akihabara, Ueno, Nippori, Ikebukuro, Shinjuku, Harajuku, Shibuya, and Shinagawa. You can use the Yamanote Line to get to major stations such as Tokyo, Ueno, Shinjuku, Shibuya and Shinagawa, where you can take other lines in order to reach various areas in Tokyo, as well as other cities. express trains, which means that the trains will stop only at major stations and some other stations on the way. The stations where the Chuo Line Rapid Service trains don't stop are covered by the Chuo Line - Sobu Line (see below). The Chuo Line - Sobu Line runs between Mitaka in western Tokyo and Chiba Station, which is east of Tokyo in Chiba prefecture. The trains of the Chuo-Sobu Line stop at all the stations between Mitaka and Shinjuku (ex. Kichijoji, Koenji, Nakano), between Shinjuku and Ochanomizu (ex. Yotsuya, Iidabashi, Suidobashi), as well as at Akihabara, Asakusabashi, Ryogoku and other stations on their way to Chiba. To learn more about the difference between express trains and local trains, please refer to the following article. The Keihin-Tohoku Line connects the areas south of Tokyo (Ofuna, Yokohama, Kawasaki) with the stations Shinagawa, Tokyo, and Ueno, going up north to Akabane and Omiya in Saitama prefecture. The Shonan Shinjuku Line also traverses Tokyo from south to north, connecting Zushi, Kamakura, and Yokohama (Kanagawa prefecture) with Shinagawa, Shinjuku, Shibuya, Ikebukuro, and Akabane (northern Tokyo), reaching Omiya in Saitama prefecture. From Omiya on, the trains on the Shonan Shinjuku Line will go either toward Maebashi in Gunma prefecture or to Utsunomiya in Tochigi. Please be aware that the Shonan Shinjuku Line stops only at major stations (the ones mentions above and a few more). This makes it very efficient when you need to travel fast to areas north and south of Tokyo. The Joban Line connects Ueno and the northeastern areas of Tokyo with Abiko and Narita in Chiba prefecture, and even with cities along the Pacific coast in Ibaraki and Miyagi prefectures. The Tokyo Monorail is a service that connects Hamamatsucho, a station on the Yamanote Line south of Tokyo Station, with Haneda International Aiport. A ride on the Monorail will bring you from Hamamatsucho to Haneda International Airport in less than 20 minutes. Please note that, while the JR lines are operating mainly surface trains, some of the lines may have direct connections to Tokyo Metro lines. This is the case of the Chuo Line - Tokyo Metro Tozai Line and the Joban Line (Local) - Tokyo Metro Chiyoda Line. The JR Rail Pass cannot be used on these lines. The Tokyo Metro network and their convenient passes will be introduced below, in the section on Tokyo's underground railways. Introduced above are some of the major JR lines that can be used to travel within the Tokyo metropolitan area. For more detailed information on all the lines run by JR East, please refer to the official website of JR East. The other regional branches of Japan Railways are JR West (operating in the Kansai, Hokuriku and Chugoku areas), JR Central (Nagoya area), JR Hokkaido (operating in Hokkaido), JR Kyushu (operating in the Kyushu region) and JR Shikoku (operating in the Shikoku region). Remember that all the Shinkansen lines are operated by JR. While the JR Rail Pass can be used on all the JR lines throughout the country, each JR branch offers their own convenient passes and discount tickets, such as the very convenient JR West Rail Pass offered by JR West. For information on discount tickets check the website of the JR branch operating in the region you're visiting. Taking into account that the JR Rail Pass is valid only on JR lines, if you want to save money while traveling around Japan, purchase a JR Rail Pass and try using mostly JR lines in order to move around. However, please be aware that many areas within Tokyo and around Japan may not be covered by the JR network. There are many other railways operating both surface trains and underground trains that may bring you directly and faster to your destination. Let's take a look at the major private railways operating in the Tokyo area. The Odakyu lines are extremely convenient if you want to travel to Enoshima and Kamakura, to Hakone, to the Lake Kawaguchi area (Mount Fuji), or to the Izu Peninsula area. The Odakyu trains depart from the Odakyu Railway platforms of Shinjuku Station. By taking the Odakyu line trains, you can reach Enoshima (Katase-Enoshima Station) in 65 minutes, Hakone-Yumoto Station in 85 minutes and Ito Station (in Izu) in 120 minutes. Odakyu Railway operates the very comfortable and convenient Odakyu Limited Express Romancecar toward Odawara and Hakone-Yumoto, which allows you to travel fast and in comfort to Hakone. Odakyu also offers several types of economical excursion tickets and convenient freepasses, which are worth checking out. If you are planning to go on a day trip from Tokyo to any of the areas mentioned above (Enoshima, Hakone, Mount Fuji, Izu), check out the Odakyu Railway map. The Keio Railway lines are very convenient if you wish to visit Mount Takao, Tokyo's most visited mountain, or Kichijoji, a very popular area among the Japanese youth. The two main lines operated by Keio Railway from Tokyo are the Keio Line, whose trains depart from Shinjuku Station toward Hachioji, the town where Mt. Takao is located, and the Inokashira Line, whose trains depart from Shibuya Station heading to Shimokitazawa, Eifukucho and Kichijoji. For a detailed map of the Keio Railway lines, please refer to their official website. The Tobu Railway lines are very convenient if you wish to travel northeast of Tokyo, to Nikko, Kawagoe (Saitama prefecture), Utsunomiya (Tochigi prefecture) or Gunma prefecture. Tobu Railway operates a total of 13 lines, with some of them connected to underground lines. These lines are mostly used by the locals who commute from and to the suburbs. Of particular interest to travelers to Japan might be Tobu's Nikko Line, which runs a Limited Express train that brings you in the shortest time to Nikko from Asakusa. Find more details about it in our article: How To Travel From Asakusa To Nikko. If you want to go by train from Asakusa to the Tokyo SkyTree, you can use the Tobu Skytree Line whose trains depart from the Tobu Asakusa Station. You can find information on the Tobu Railway lines and on their convenient discount passes, which are available only on the Tobu lines, on their official website. If you plan to visit the tradition-rich and picturesque Chichibu or Kawagoe areas in Saitama prefecture, you will be taking the Seibu Railway trains. There are two main lines operated by Seibu Railway: the Seibu Shinjuku Line with trains departing from Seibu-Shinjuku Station (Shinjuku) toward Hon-Kawagoe, and the Seibu Ikebukuro Line with trains departing from Ikebukuro Station toward Seibu-Chichibu Station. Please refer to this map for the routes covered by Seibu Railway lines. Information on their convenient limited express trains and discount tickets can be found on their official website. Keisei Electric Railway operates the Skyliner, as well as the Access Express and Limited Express lines connecting Tokyo (Nippori Station or Keisei Ueno Station) with Narita Airport. From Narita Airport, the fastest way to get to Tokyo is taking the Skyliner. Keisei Electric Railway also operates the only direct train line that connects Narita Airport to Haneda Airport - the Access Express, so it is extremely convenient. For more information on the routes and services of the Keisei Electric Railway, please refer to their official website. The Keikyu Main Line connects inner Tokyo (Asakusa, Shinagawa) with Yokohama, Yokosuka and Haneda Airport International Terminal. The Keikyu Line also offers convenient discount tickets, so check out the information on their official website. There is a total of nine lines operated by the Tokyu Corporation, among which the Tokyu Toyoko Line, which connects Shibuya to Yokohama, is a major line used by many people every day. Please refer to this Tokyu railway map for details on all the Tokyu lines. These are the major private railway companies operating surface trains in the Tokyo area. Please note that, although the JR Rail Pass cannot be used on these lines, they each offer discount tickets and convenient passes which are worth checking out. From here on, we will be introducing the two major underground railway networks operating in the Tokyo area - Tokyo Metro and Toei Subway. There are two major railways operating underground trains in the Tokyo area: Tokyo Metro and Toei Subway. Let's see what are the differences between them and the convenient discount tickets they each offer. Tokyo Metro operates a total of nine subway lines, which ensure smooth transportation throughout the Tokyo metropolitan area. Many of the Tokyo Metro stations offer convenient connections to surface lines such as the JR and other railways. The Ginza Line, whose symbol is an orange circle with a capital G inside it, connects Shibuya and Asakusa, with stops at major shopping and sightseeing areas in Tokyo such as Ginza, Nihonbashi, and Ueno. To see all the stations on this line and the available connections, please refer to this map of the Ginza Line. The Tozai Line, marked through a sky blue circle with a T inside it, traverses Tokyo from east to west connecting the Nishi-funabashi Station in Chiba prefecture with Nakano Station in central Tokyo. Some of the major stations on the Tozai Line are Otemachi (close to Tokyo Station), Nihonbashi, Waseda and Takadanobaba. See all the stops on the Tozai Line on this official map. The Namboku Line, marked by an emerald green circle with a capital N inside it, traverses the metropolitan area from south to north, connecting Meguro Station (which is south of Shibuya) to Akabane-iwabuchi Station in the north. If you wish to check out the stations on the Namboku Line, please refer to this map. The Marunouchi Line, which can be identified by its symbol - a red circle with an M inside, makes an almost complete loop around the center of Tokyo, connecting Ikebukuro Station with Ogikubo Station. The trains on this subway line also stop at Shinjuku, Ginza, and Tokyo among other stations. Find a complete list of the stations on Marunouchi Line here. The Hibiya Line, marked by a silver circle with a capital H inside, connects Naka-meguro Station in the western area of Tokyo with Kita-senju Station in the northeast. Major stations on the Hibiya Line include Roppongi, Ginza, Tsukiji, Akihabara and Ueno. For details on Hibiya Line please refer to this page. The Chiyoda Line, whose symbol is a green circle with a capital C in it, connects Yoyogi-uehara Station (south of Shibuya) with Kita-ayase Station (east of Tokyo). The trains of the Chiyoda Line also stop at Omotesando, Otemachi and Nishi-nippori. A detailed map of the Chiyoda Line can be found here. The Yurakucho Line, marked by a golden circle with a capital Y, connects Wakoshi Station in Saitama prefecture with Shin-kiba Station. The Yurakucho Line trains also stop at Ikebukuro, Iidabashi and Tsukishima. For details on the Yurakucho Line, refer to this page. The Hanzomon Line, marked by a purple circle with a capital Z inside, connects Shibuya Station with Oshiage Station (Tokyo SkyTree area). It also has stops at Omotesando and Otemachi among other stations. The Hanzomon Line is directly connected to the surface train lines Tobu Skytree (which goes northeast of Tokyo) and the Tokyu Den-en-toshi Line, which allows access to the southwestern suburbs of the metropolitan area, including Yokohama. You can check out all the stations on the Hanzomon Line on this page. The Fukutoshin Line, whose symbol is a brown circle with a capital F, connects Wakoshi Station with Shibuya Station, with stops at Ikebukuro and Shinjuku-sanchome. You can find details on the Fukutoshin Line here. While the JR Rail Pass cannot be used on the Tokyo Metro lines, Tokyo Metro offers the extremely convenient 24-Hour All-You-Can-Ride Ticket which is valid ONLY on Tokyo Metro lines. For more information on the Tokyo Metro railway network, please refer to the Tokyo Metro official website. Toei is a transportation network operated by the Tokyo Metropolitan Government. There are four Toei Subway lines, along with two surface lines: the streetcar Toden Arakawa Line, and the Nippori-Toneri Liner. We will introduce the four Toei Subway lines. Please be aware that they can be easily confused with Tokyo Metro lines, but they are essentially a different network, requiring separate tickets. Toei Asakusa Line, whose symbol is a rose red circle with a capital A, connects Oshiage Station (Tokyo SkyTree) with Nishi-magome Station in southern Tokyo. The Toei Asakusa Line also stops at Narita Airport, Haneda Airport and Asakusa, so it's very convenient to move around efficiently in Tokyo. The Mita Line, marked by a dark blue circle with a capital M inside, stops at stations such as Suidobashi (Tokyo Dome), Otemachi and Meguro. The Shinjuku Line can be identified by a leaf green circle with a capital S inside. It stops at stations such as Shinjuku, Ichigaya, and Suidobashi. The Oedo Line, whose symbol is a magenta circle with a capital E inside, is convenient when you want to travel to and from Shinjuku, Roppongi, and Ryogoku. Toei Subway offers the very convenient Toei One-Day Pass (Toei Marugoto Kippu) which allows unlimited use of the entire Toei transportation network (Toei Subway, Toei Bus, Toden Arakawa Line, and Nippori-Toneri Liner). This pass can be purchased for 700 yen for an adult and 350 yen for a child passenger. Visitors from abroad can also use the Tokyo Subway Ticket, issued by Toei Subway in collaboration with Tokyo Metro. This ticket is available in 1-Day (800 yen), 2-Days (1200 yen), and 3-Days (1500 yen) versions, and allows unlimited use of all the Toei Subway and Tokyo Metro lines. For details on this extremely convenient ticket that can be used only on the underground train lines in Tokyo, please refer to the Toei Subway information page. 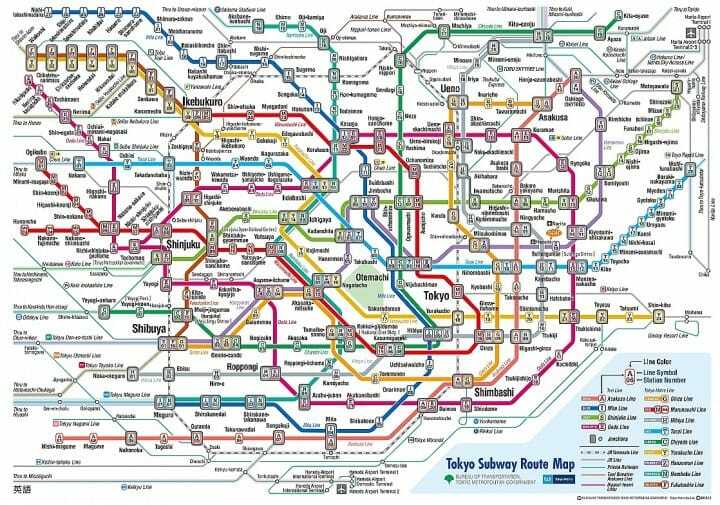 The trick to figuring out Tokyo's train system is distinguishing between surface train lines and underground train lines, as well as understanding that there are various railway companies operating these lines. A different railway network means separate fees, so if you wish to save up on transportation costs, you should try to stick to one railway network (either surface trains or underground trains) and use it as much and as efficiently as possible. We also recommend checking out the convenient discount tickets and passes offered by each network. Some of these tickets are available only on a particular network of train lines but are very cost-efficient. Last but not least, we strongly recommend the use of IC cards (Suica or Pasmo), which can be charged and used on any train (surface or underground) and bus line in the Tokyo area. You can save yourself a lot of precious time and money by using a rechargeable IC card instead of buying train tickets all the time. For details on how to buy and use IC cards, please refer to our article: Get Around With Ease: How To Buy Your Own Suica. Greater Tokyo Pass - Travel By Train All You Want For 3 Days!